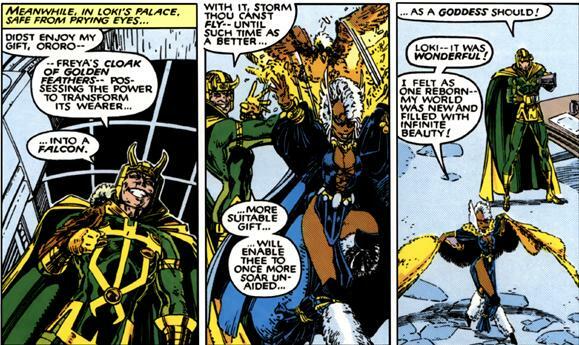 As a mortal Storm had the ability to mold the earth’s weather patterns to her will but lost these abilities. As ruler of Asgard she has access to an unlimited amount of power known as the Odin-Force. The Odin-Force was the power that Odin himself wielded before his death that was then passed to Storm as the new ruler of Asgard. The Odin-Force was comprised of Odin’s power as King of Asgard combined with the powers of his brothers Vili and Ve. These powers under Storm control made her one of the most powerful beings in her timeline. “Stormcaster” is an Asgardian enchanted hammer forged by the Eitri at the behest of Loki god of mischief. Granted powers by Loki to mimic those of Mjolnir, Thor’s hammer, Stormcaster is a formidable weapon able to hold its own against Mjolnir though it is not as durable. Wielding Stormcaster, Storm can summon and control the weather causing rain, wind, thunder and lightning. With it, she has shown the ability to create electrical storms, hurricane winds, tornadoes, tidal waves, blizzards as well as earthquakes. She can also stop any of the weather conditions she creates. 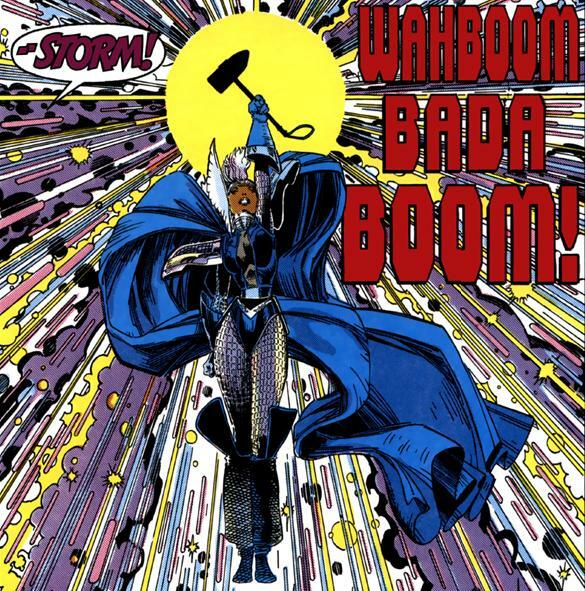 The abilities of Stormcaster give her control of the weather exceeding those she had as a mutant; she can channel the great energies of the weather into powerful blasts that she can direct through her hammer. “Freya’s Cloak of golden feathers” allows flight and limited shape shifting into that of an eagle with black feathers, blue eyes and a white Mohawk. This version of Storm came into being after the X-men were taken to Asgard where she was granted the mighty hammer Stormcaster which gave her powers similar to that of Thor the god of thunder. After their adventures the mutants who remained voted on whether or not they should return to earth on earth 616 Ororo had the deciding vote and decided to go home but on this world she chose to stay [What If? (vol.2) #12, April 1990]. Broght before all of Asgard during the Amphitheater of the Althing where Asgard gathers to choose a new leader Loki presented Storm as a potential ruler. Confronted by a transformed Thor she was almost killed in battle. A terrible war raged in Asgard as a result as Hela tried to take her soul. Banding together with the Valkyrie and a reformed Thor they vanquished Hela leaving Dani Moonstar as the new queen of hell. For her part in the battle Storm was chosen by Thor to be the ruler of Asgard and this she did with her trusted Vizier Cypher. Her rule was wise and just based on the old laws of the realm [What If? (vol.2) #12, April 1990]. Loki for his machinations was cast into the future where he went mad ruling over a decimated and empty Asgard [What If? (vol.2) #12, April 1990]. During the 2015 end of creation event She is one of the survivors who become part of Dr. Doom’s personal army of enforcers called the THORS. This version is from before she became all mother of Asgard. 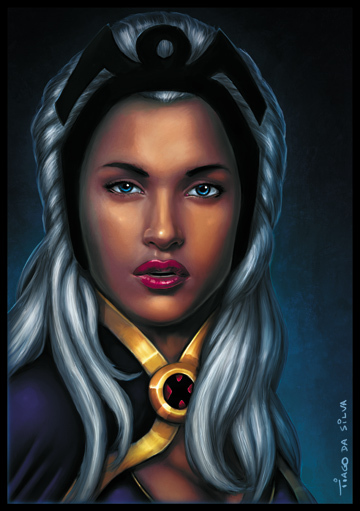 Storm (Earth 616) is a mutant with the ability to perceive and manipulate the forces and elements that govern weather. She’s a mainstay and veteran member of the X-Men, Avengers, Fantastic Four, an accomplished tactical field leader, Headmistress of the Jean Grey School, and the former Queen of Wakanda. Bloodstorm (Earth 1298) In this world instead of recovering from being bitten by Dracula Storm died and was reborn as a vampire. She joined Alex Summers super team “The Six” where she fell in love with fellow Vampire Gambit. She maintained her 80’s style Mohawk in this world and was more feral. Amazon-Storm & Thor-Storm, are really nice twist. I can recall reading the what-if issues where Ororo is wielding her hammer. That was the only time I ever appreciated her having a Mohawk. It fitted the look. Otherwise the goddess looks like a gothic punk rocker.